I wondered when a comparison would be done! 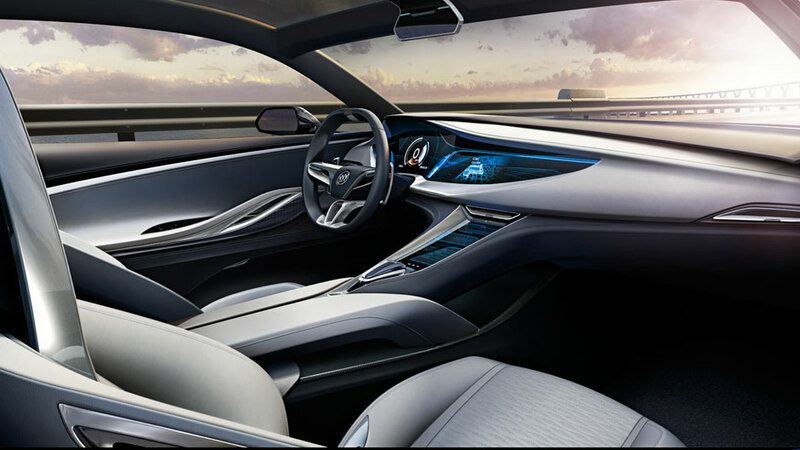 I'm not sure how viable Faraday Future is; the only prototype vehicle they show doesn't look practical whatsoever. I also can't tell, from the pictures, what the seating is - is it traditional tandem seating, or is it a bobsled arrangement? 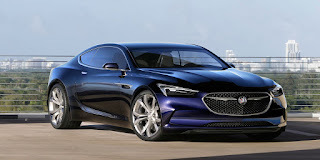 We surely don't need another bankrupt EV company using state or federal funds, but I wish them the best. 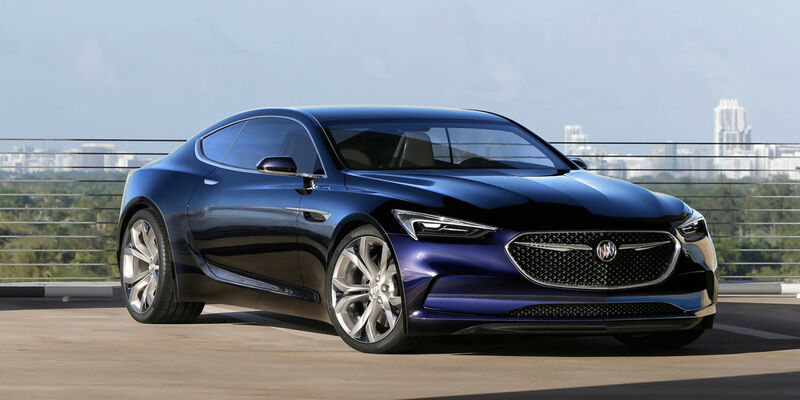 This concept would greatly help a non-managed battery pack, such as the Nissan Leaf. 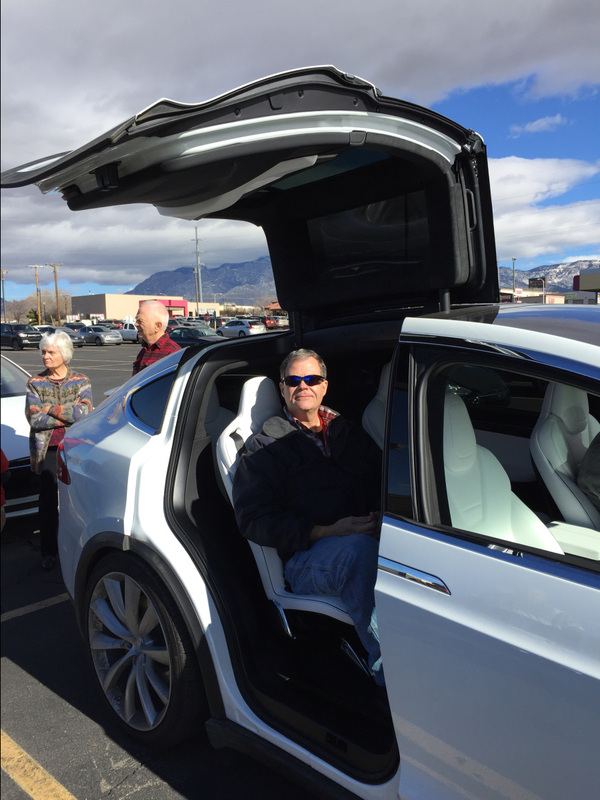 We have a new member, Tom Gorab, who owns a 2013 Tesla Model S P85. We hope to see him at our next monthly luncheon; please make him welcome. Mac McCauley and I visited the place today, tried out the 40-amp chargers! Yes, I KNOW it says Tesla on the front when we are actually a group of many car brands. 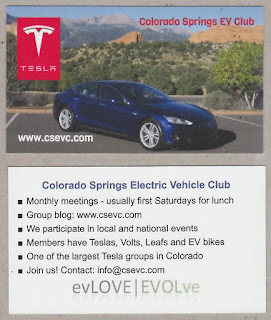 The primary use of this card is to leave at the Tesla Supercharger in downtown Colorado Springs, or to give to the media. We can certainly make a more generic card for club members if they like. Yes, I KNOW that's a photo of MY car. We wanted the card printed quickly and it's what I had on hand. This is not the latest version, that one (being printed) has a blank line on the back to put your personal information. Feel free to make your own cards to give at shows based upon this design, and I suggest you use your club email address to prevent giving out a personal email address. The scan image is bad but the printed card will be much better. I used PrintsMadeEasy on the web to print it; there are many such companies but that's the one I've used for years. The first 100 cards, about $20 (plus shipping); 500 are $50 (plus shipping). 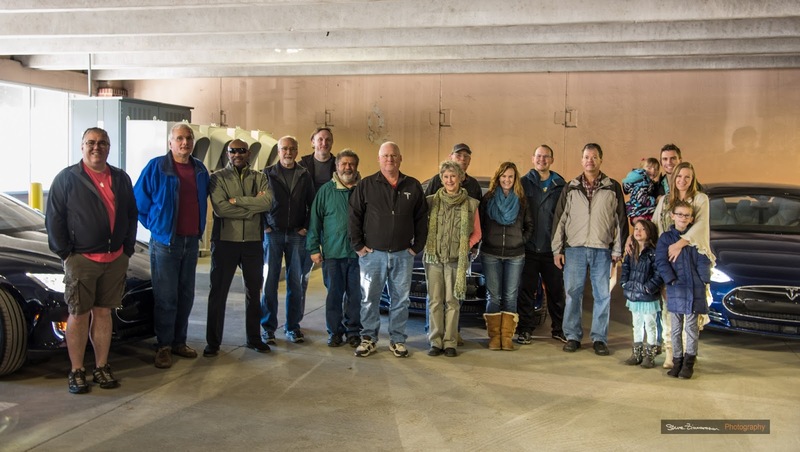 Well, now we know there are sub-contractors involved with Teslas. I thought everything was made in-house except the batteries. Tesla has dropped the initial supplier of their Falcon Wing doors and is suing them. I follow ("subscribe") to a YouTube channel by Ian Sampson. He lives in the UK and has owned a Nissan Leaf for a year or two, one of the early adopters. I find his experience with his Leaf in the UK quite interesting...he's driven his battery dry, arrived home with "- - -" on the battery gauge, hauled large packages in it and absolutely loves it. 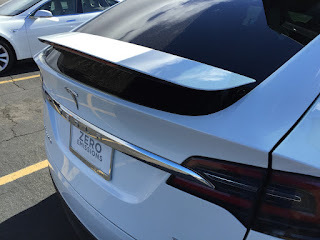 Regardless of your brand preference for an electric vehicle, I recommend his videos for a real-world peek into EV ownership. 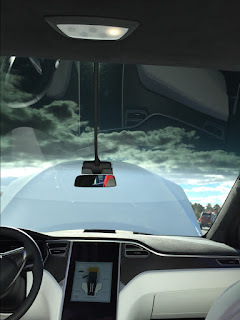 As an example, Ian just published a new video, Episode 89, of his low-battery experience and his test drive of a new UK owner's Tesla 70D with autopilot. Due to a poor choice of blog designs, I am unable to publish the direct link to Ian's video because our blog software will not reference an "https://" link when you've purchased your own domain name as we have. I recommend our group dismiss our blog administrator with a generous severance package. If you'd like to see Ian's video, please go to YouTube and search on "Episode 89 - Nissan Leaf Owner" or search on Ian Sampson and look for Episode 89. 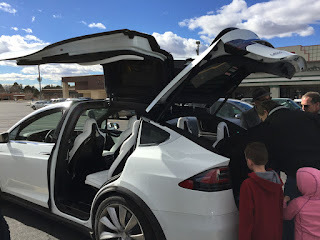 Being a veteran Tesla owner for hundreds of thousands of minutes, I thought I'd share my recent nice-weather EV experience to New Mexico. It was amazingly easy to plan and the trip was very pleasant. At my age, drinking the caffeinated and frequent beverages I do, stopping for 30 minutes to charge every couple of hours was GREAT. Use the weather app on your phone or on the Internet to find the temperature prediction for the day you're leaving. Use EVTripPlanner to plot the distance between each charging point. You can certainly put your final destination instead of each waypoint, it's just a matter of choice. I run/print the EVTripPlanner output 3 times - once for the expected temperature and two more times for 10 degrees a time less than the expected temperature. For example, if I expect 30 degrees F for my trip, I run the estimate again changing only the temperature to 20 degrees F, then again for 10 degrees F. You will be surprised how much the expected temperature can change your rated miles. Add whatever distance cushion you're comfortable with. This last weekend's trip being my first one, I added 25% additional rated miles to whatever EVTripPlanner came up with. After my trip, I would not use estimates as low as 15% depending on how cold it gets. I found that the "Trip" tab on the Tesla energy app was dead-on about your remaining battery %. I prefer to know what I'll have left at my next charging point so I can adjust my driving habits to save energy if necessary. I found that in all cases, the energy remaining estimate was within 2-3%. Set autopilot, read a book. If you're not on a Supercharger route, use Plugshare.com website (or the phone app) to find alternate charging points along your route. 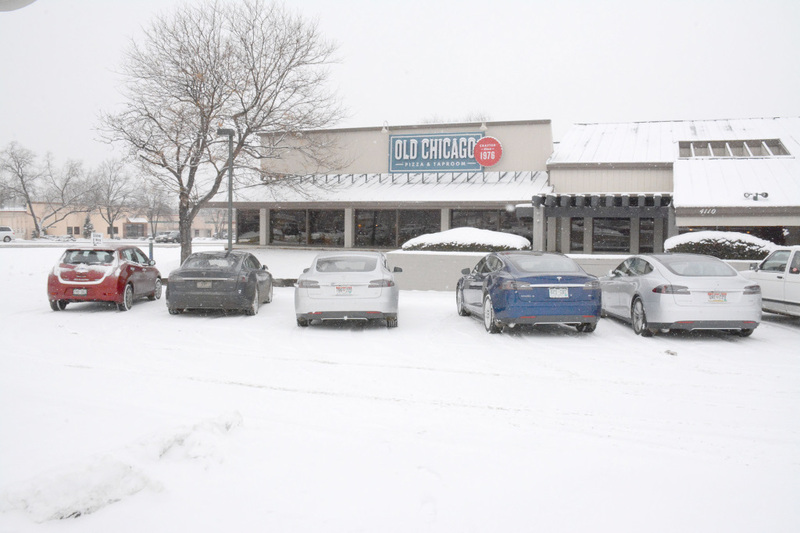 Call Domino's Pizza and request a delivery pizza at the charging place you select. If Domino's won't deliver to that location, DO NOT CHARGE there. That's also a great tip when buying real estate! You don't want to live anywhere Domino's won't deliver pizza, just sayin'. 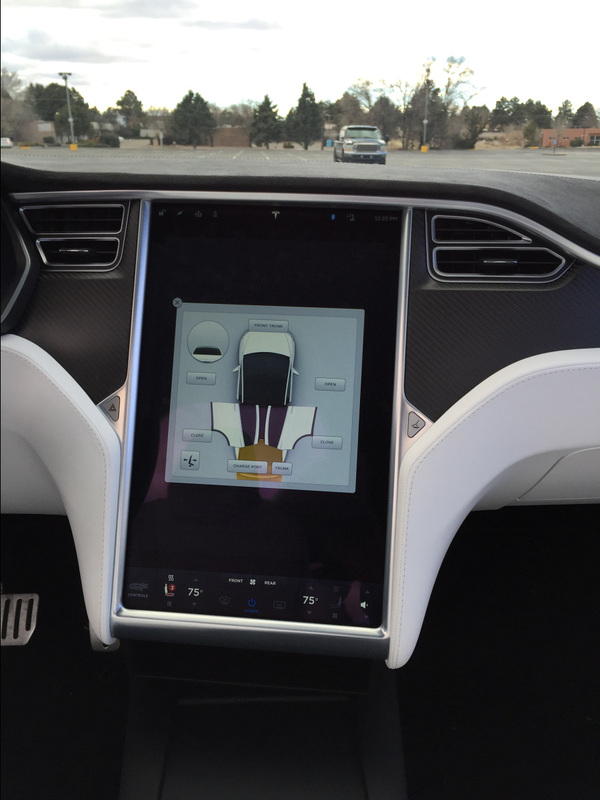 Plan on 30 minutes of Supercharge to put back approx. 120 miles between chargers. When completed, Tesla's Gigafactory will manufacture more batteries than the world makes right now. Panasonic, the current sub-contractor that supplies Tesla with batteries, is investing in the factory. This surprises me, as it implies that Panasonic will somehow benefit from the Gigafactory's output. I assumed that Tesla would cancel any outside supplier of batteries and use its own production to cut costs. 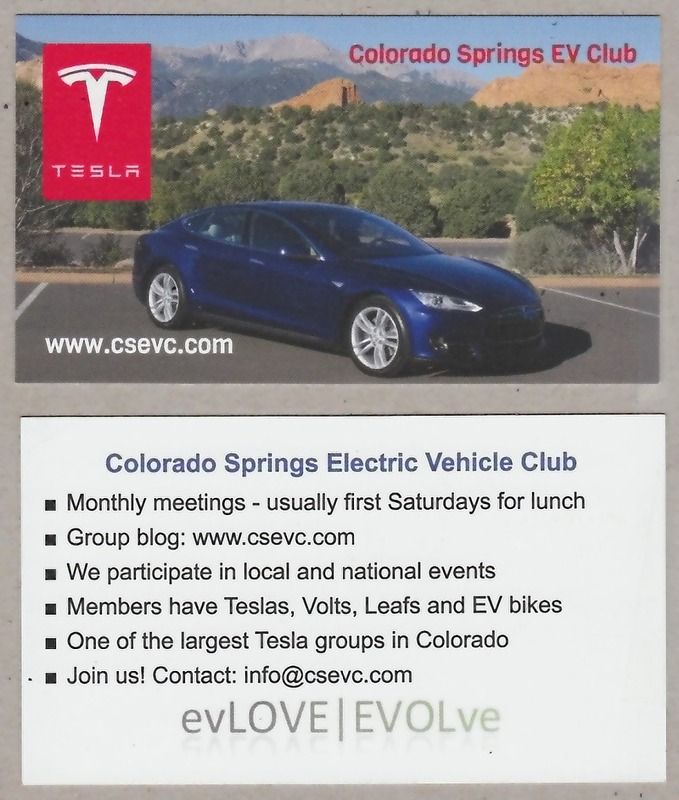 The EV club is printing up business cards that show our club blog address and gives information about our group. 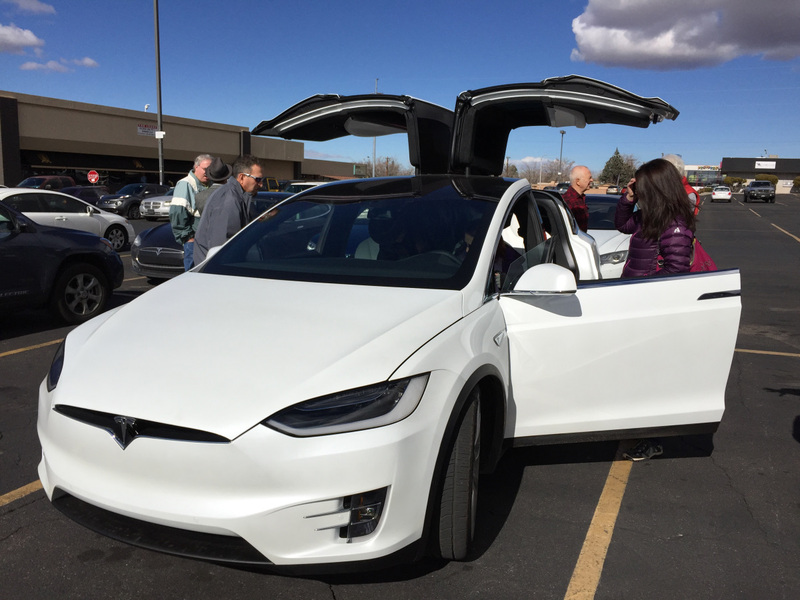 We would like the Denver Tesla Service Center to give out a card to any new owners that might be interested. A sample run (100) of our cards are being printed and once the club approves them, we'll run of a larger amount and give each member a number to hand out at car shows. As a veteran car show exhibitor, I have always had business cards available to hand out at a show. They help visitors to remember you if there's a popular vote being taken, and have helped interested parties to contact me for things like charity events and special exhibits. In case you're interested in making your own cards (it's a great place to use our club forwarding addresses! ), feel free to visit www.printsmadeeasy.com . There are many places on the web that will print business cards, this is just the one I've used for years. One night late this week, I sent an email suggestion to Love's Truck Stops to add EV charging to their chain of stores. I've been to several Love's Truck Stops and found them clean and attractive places to refuel and have a break. To my surprise, I received a response rather quickly late at night. The reply is below, as is my initial suggestion. I have NO IDEA if they'll actually consider adding vehicle charging to their stores, but I was pleased that someone actually read my email! 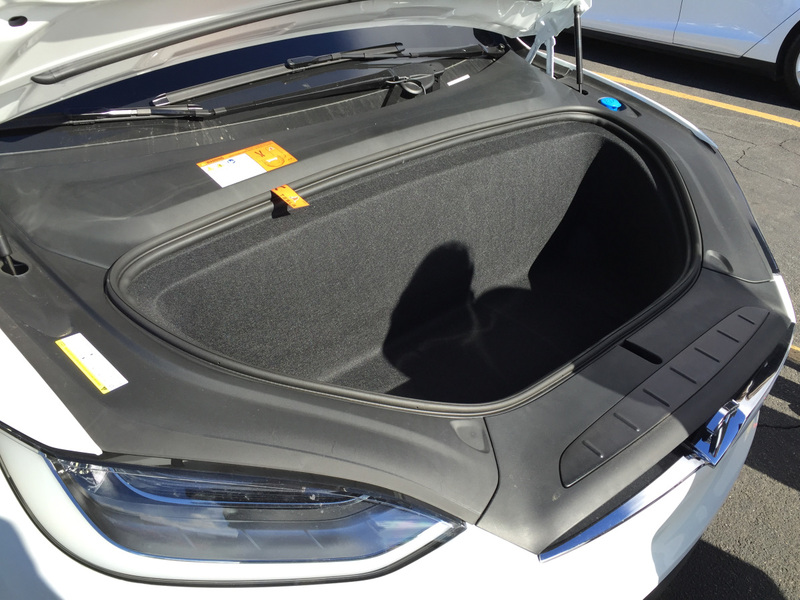 Hello Wilson, thank you so much for your suggestion to add car charging stations to our stores. That sounds like a great idea and we’ll make certain it is passed along accordingly. We want to know what’s important to you and appreciate the time you’ve taken to reach out to us! RSVP on their meetup page. It sounds more troublesome than it is, believe me. 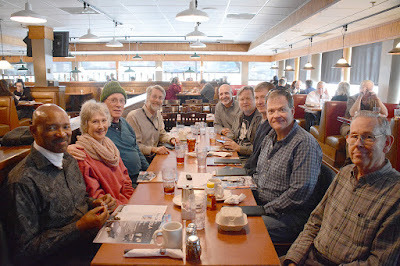 Our club may want to consider joining "meetup.com", we can certainly discuss it at the next club lunch (first Saturday in Feb.). 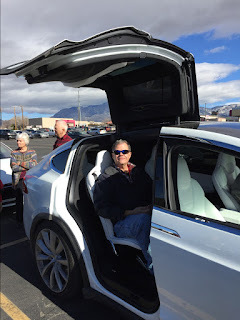 The link to the Tesla Club of New Mexico is Tesla-Club-of-New-Mexico. Just go to the site and inside of 3 minutes you can sign up and RSVP, easy peasy. 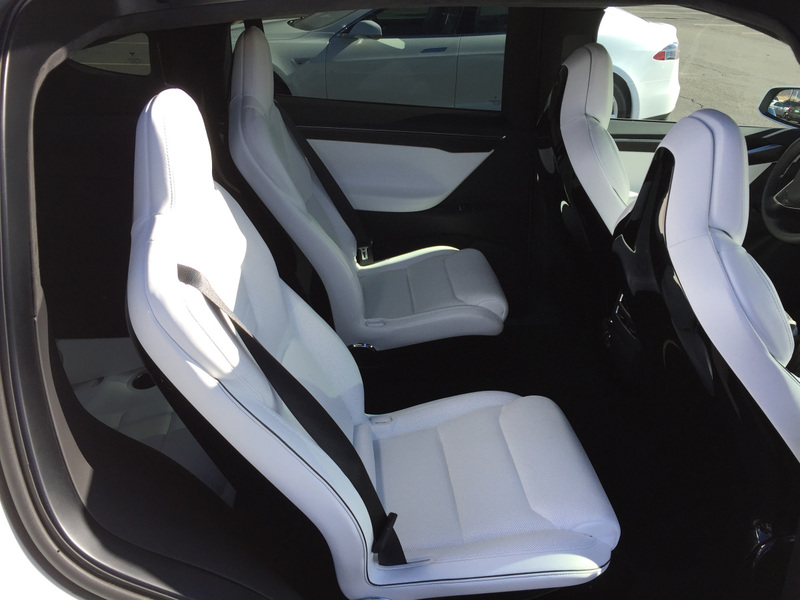 As a new owner, I'm looking forward to my first overnight trip in a Tesla to see how well I judge driving range, supercharging times, etc. The trip to Albuquerque is 100% doable in a Model S85 as there are Superchargers all along the way (COS -> Trinidad -> Las Vegas, NM -> Albuquerque). 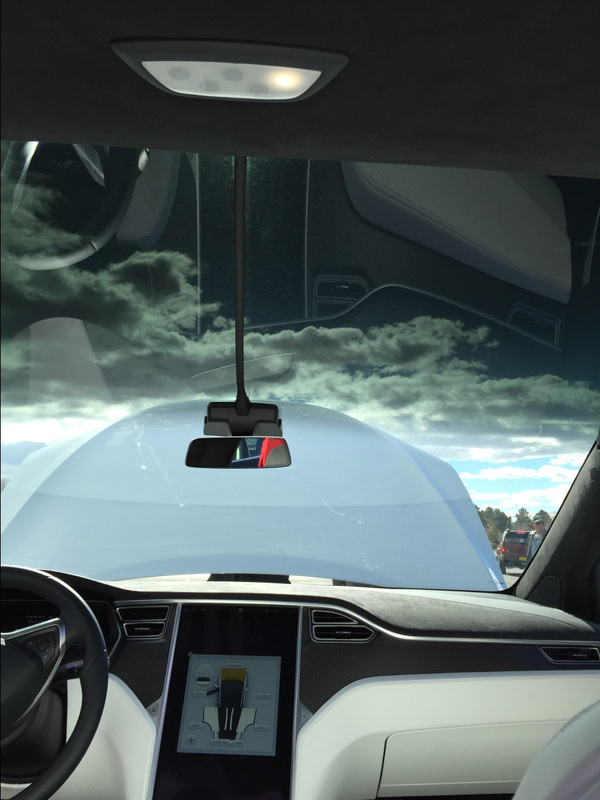 2015 Model S owners, if you have the Autopilot sensors, will soon be getting the "summon" feature with the 7.1 release of software. Click the link below to see a new owner's video. Update: I can personally attest that auto-summon works great! 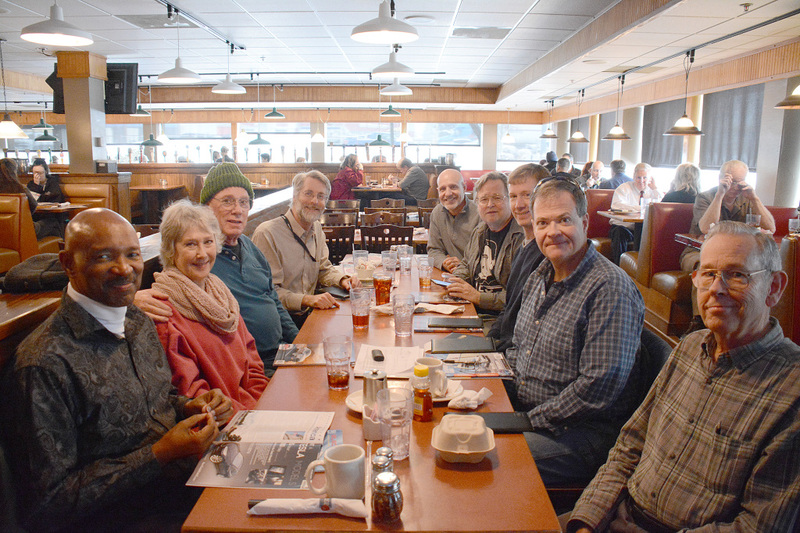 -Wilson H.
We had our first group lunch on Jan. 8, 2016 at Old Chicago Restaurant and Taproom at Academy Blvd. and Austin Bluffs Pkwy in Colorado Springs. Given the bad weather, we had a great turnout. Thanks to Ed Post for taking the photos for us. 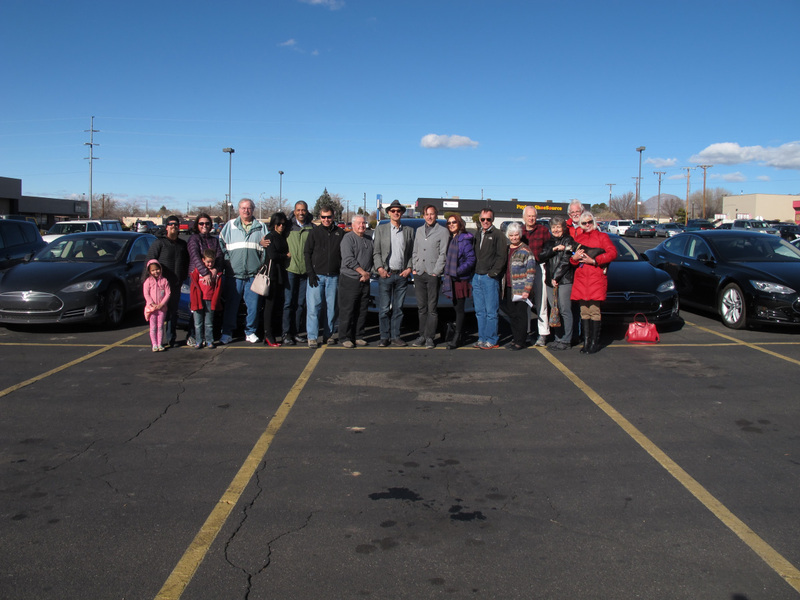 One of the first events our group gathered for was the Tesla Colorado Springs Supercharger Party. We celebrated the "go live" event the first weekend the Supercharger was open. Steve Zimmerman took our group photo, and Tesla re-tweeted it. 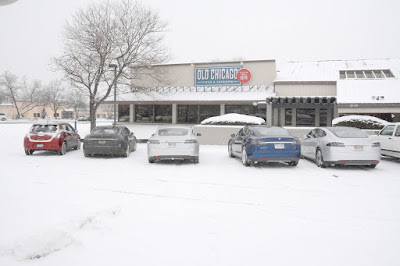 We had 13 Teslas in attendance, and had a rousing lunch at the downtown Old Chicago Taproom. Tesla's Supercharger is a 215 N. Cascade, Colorado Springs, CO. $1 to park, charging is free.